The Gothic Cathedral is an exceptional achievement. The structure, dark with age and solemnity, was meant not only as the principle church of the Castle but also as the spiritual centre of the whole country. The original Romanesque Rotunda of St. Vitus was founded in the second decade of the 10th century by St. Wenceslas in order to house a gift from Emperor Henry the Fowler, the shoulder of St. Vitus, a defender of the Holy Roman Empire and henceforth also a patron saint of Bohemia. He built it on the highest place in Prague Castle and by doing so he determined forever the layout of the secular and religious buildings in the third courtyard. The Romanesque Rotunda, where St. Wenceslas himself was buried and also St. Vojtěch the second Prague bishop, was soon unable to accommodate all the believers visiting the holy relics. Prince Spytihněv had it demolished and in its place started to build a 70 metre long basilica, completed in the reign of his successor Prince Vratislav II who was crowned Bohemian King here in 1085. In the basilica other rulers were also crowned, the last one being John of Luxembourg and his wife Eliška Přemislide. 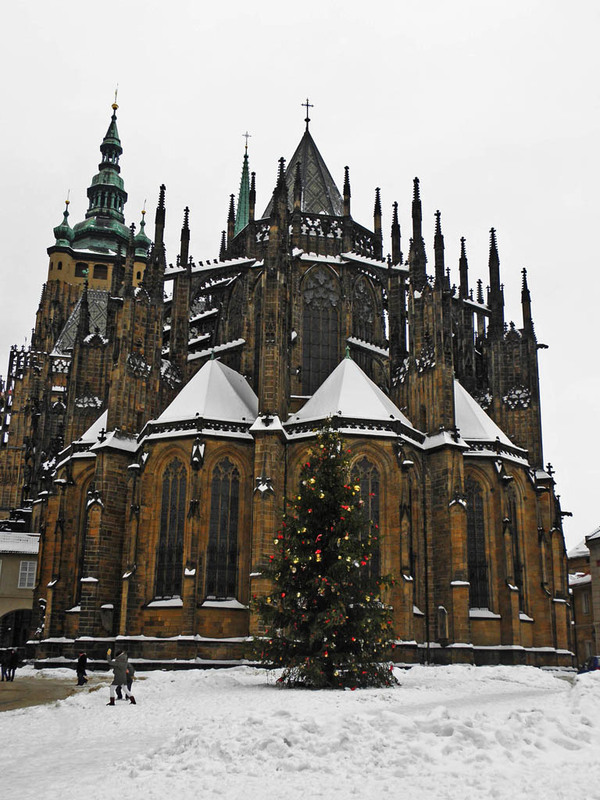 Their son Wenceslas was christened in the Cathedral, and later at his confirmation accepted the name Karel (Charles). It is Charles as king and emperor, who deserves recognition for the building of the Gothic Cathedral. The term cathedral has two distinct meanings: ecclesiastical and architectural. From an ecclesiastical point of view a cathedral church is every church under the jurisdiction of a bishop’s or archbishop’s chair or cathedra; therefore there are in the country as many cathedral churches as there are bishoprics. From the architectural point of view the Gothic cathedral is a type of church construction whose essential difference is the gallery with the garland of chapels enclosing the main nave in such a way that the main altar stands in the centre and can be walked around at the back to gain access to the chapels. In our republic only four churches of cathedral type exist: in addition to St. Vitus there is the Cathedral of St. Bartholomew in Kolín, the Cathedral of the Virgin Mary in Sedlec near Kutná Hora and the Cathedral of St. Barbora in Kutná Hora. In 1344 the Prague bishopric was elevated to the status of an archbishopric. This significant change was to be symbolised by the building of the new Cathedral of St. Vitus. The foundation stone for the new building was laid on 21 November of the same year by King John of Luxembourg in the presence of the heir to the throne Charles, archbishop Arnošt of Pardubice and other religious and secular dignitaries. From the beginning the old basilica was still in use, however as the work progressed, the old building was gradually taken down, to make room for the new. The first architect of the Cathedral was Matyáš of Arras during the years 1344-1352, who, in the classical linear style of the French cathedrals, built eight chapels at the east end of the Cathedral. After his death Charles IV chose as the architect, 23 year old Peter Parléř from Swabian Gmund. Parléř was an an architect and sculptor of genius who pioneered late Gothic and thanks to his original ideas Prague Cathedral ranks by right among the most important buildings of its type. Among the characteristics of his work are the network of ribbed vaulting, the flamboyant curvilinear style, the sculptured supporting pillars and bold, protruding ceiling bosses. The young architect also changed the groundplan of the chapels from a triangular to a rectangular shape. This change is clearly visible in the layout of the chapels where Parléř linked up with the unfinished work of Master Matyáš of Arras. Until his death in 1399 Parléř managed to build the rest of the choir chapels, create the triforium and roof the choir. He had started to build the transept and the tower, however just before his death as if he sensed that the future would not be favourable to his building he closed up the choir by constructing a temporary wall with a rosette. This “temporary solution” was to last nearly 500 years. Thus the Cathedral was not then completely finished and remained approximately half of today’s length. Admittedly the Parléř iron foundry continued with the building until 1419, but it concentrated on finishing the decoration of the parts already completed. 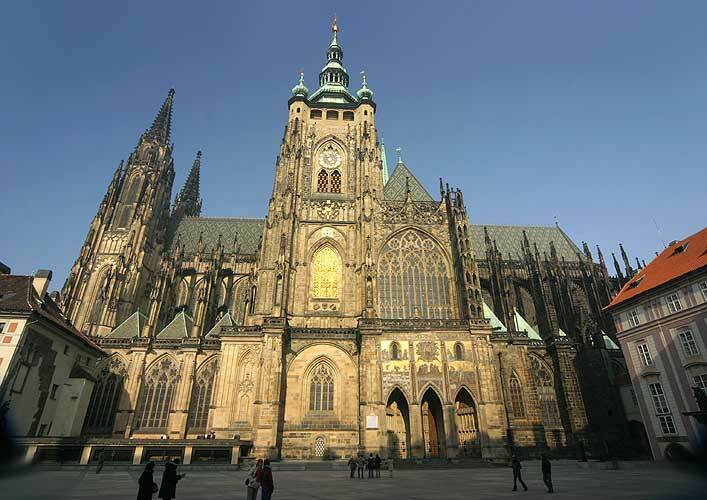 The incomplete state of the Saint Vitus Cathedral was nothing unusual. Gothic cathedrals were always very costly and therefore subject to lengthy building schedules. During the construction the craftsmen who participated in it, were based in iron foundries – a type of building workshop set up on large construction sites. The foundry gathered together masters of different crafts and frequently even had a family character. Within this family framework building techniques, pattern books and “trade secrets” were passed on from generation to generation. The members of the foundry stood apart from the craft guilds and were personally autonomous. The best of them travelled from town to town and hired local stonemasons, bricklayers and carpenters. The most respected craftsmen were stonemasons and wood carvers who, on the ground, carved and sculpted individual pieces of the structure and decoration. In addition there were bricklaying, carpentry and other crafts. A Gothic cathedral was usually started at the east end, where the main altar was to stand. At the same time the foundations of the church tower were laid so that the weight of masonry could settle slowly. When the walls reached the height at which the vaulting could be started, the nave was roofed over and only then the gothic vaulting would be built underneath it. The load bearing ribbing created a sort of skeleton construction which was later filled in to complete the vaulting. In the 19th century, during the era of Romanticism, the idea of completing important buildings from the Middle Ages spread through the whole of Europe. For instance the well known Cologne Cathedral was completed among others. In Prague, in 1861, under the leadership of architect Josef Kranner, work commenced on the renovation of the Cathedral and from 1873 under the direction of Kranner’s successor Josef Mocker, the construction began of the new western end of the Cathedral with twin towers. Not even Mocker lived to see the completion of the Cathedral, he died exactly 500 years after Parléř in 1899. Only the later architect, Kamil Hilbert, whose construction work was more sensitive to the older architecture, led to the celebrated consecration in 1929. The completion of the Cathedral met with much excitement but also much criticism, because it altered the centuries old silhouette of the Castle. Nowadays the completion is no longer condemned; time wipes away the differences between the old and the new and we can even admire the artistic decoration of the styles of the 19th and 20th centuries. The outside of the Cathedral initially captivates us by the richness of its Gothic buttressing and decoration. Externally the Cathedral was to be reminiscent of “the City of God”, so that everywhere we can see various “little towers” (pinnacles), suggestions of house gables, “passageways”, staircases and balustrades. From Jiřské Square a veritable stone forest of flying buttresses, pillars and pinnacles can be seen, making the structure of the Cathedral most visible. Below the roof our attention is captured by the Gothic gargoyles, which drain away the water. They have the likeness of monsters, devils and evil creatures. The Cathedral was protected by them against dark powers, because according to an old belief, a demon is frightened of its own image on a facade and flies away. The portrayal of devils on the outside of a church also has another, spiritual purpose. It reminds the believers that all the badness they possess should be stripped away outside so that they can come to the cathedral freed from the impure temptations of life. The triple entrance is by a design of Peter Parler. This German architect followed the first architect of the St. Vitus Cathedral, Matthias of Arras, after his death in 1352. His sons Wenceslas and Johann were in charge of construction after Parler deceased in 1399. 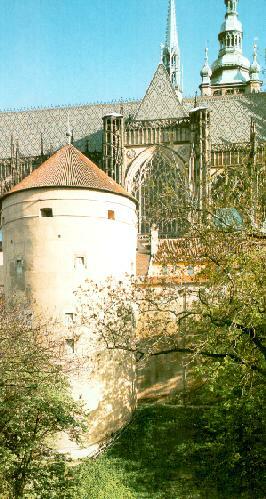 In the 16th Century Bonifaz Wolmut finished the south tower of which the ‘Golden Gate’ is part. It was renewed in 1770 by Pacassi. At the south side we stop in front of the Zlatá Brána (Golden Gate), facing an arcaded portico supporting a treasure chamber for the Crown Jewels, of which we can observe two little windows above the side arches of the arcade. This entrance belongs to the part of the Cathedral with the most highly decorated masonry. Peter Parléř here relieved the Gothic ribs of their load as much as possible and even let them float freely in space! The walls of the entrance arcade are covered in mosaics called “Adam and Eve” and “Crucified Christ” by Karel Svolinský. The most precious is of course the mosaic on the facade of the Golden Gate. It represents the Last Judgement: in the centre sits Christ in a halo, judging the living and the dead, under him are kneeling as supplicants the earthly patrons, and even lower, on the edges of the centre arcade kneel Charles IV and his wife Eliška of Pomerania. In the pictures on the left and the right, the Apostles are pleading on behalf of the sinners and below them are represented scenes from the Resurrection and the Day of Judgement. The mosaic was created between 1370-1371 after designs by Italian masters, and is made from chipped flint and glass in 33 shades of colour. The 96.5 metre high Cathedral tower is topped with a Renaissance helmet, on which is fixed a 3.5 metre high gilded Bohemian lion. 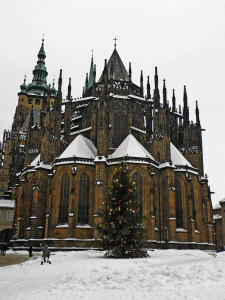 The tower is (probably intentionally) placed asymetrically on the south side of the Cathedral close to the grave of St. Wenceslas, the defender of the Czech lands. It acts here as a symbolic substitute for the traditional defensive tower of gothic castles, which in Prague is absent. On the first floor of the tower there is a remarkable gilded grill from the time of Rudolf II, whose monogram is displayed a little higher up. The clock which has two faces also comes from the same period. One face shows only hours and the other only minutes. This solution used to be frequently adopted because it was very difficult to set the axes of both hands into the centre of one face. There are four bells in the tower. The bell called Zykmund, cast in 1549 by Tomáš Jaroš, is the largest in Bohemia, weighing approximately 15,120 kg and measuring 256 cms in diameter. Until the introduction of telephones the bells were used not only for liturgical purposes but also for emergency fire warnings. The new western facade with two 82 m high towers is decorated with 14 statues of saints and busts of the modern builders of the Cathedral under the huge stone rose window. We enter the main nave through the bronze doors, which illustrate the history of the building of the Cathedral. The heightened complexity of its inner structure contrasts with the nobility and peace of the interior of the Cathedral. The Cathedral is 124 m long by 60 m wide measured at its widest point across the transepts and the height of the main vaulting is 33 m. The vaulting of the main nave is called net vaulting and was used for the first time in central Europe by Peter Parléř. 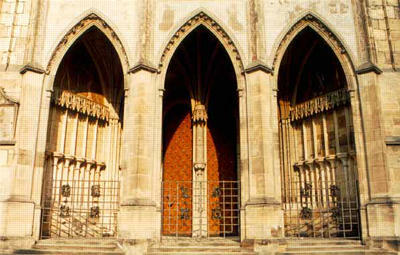 It is not divided into separate sections of vaulting with crossed Gothic ribs, but it advances towards the front of the Cathedral continuously so that the eye can easily slip along from the entrance towards the altar and back. 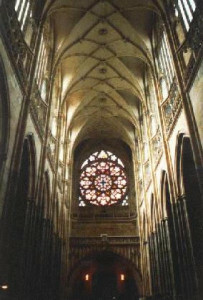 The windows along the sides of the main nave are slanted inwards and therefore partly hide the pillars in between them. In this way an impression is created optically of an almost insubstantial wall, formed seemingly only of stone tracery filled in with glass. The windows of the Cathedral transmit a subtle and frequently coloured light. It used to have not only aesthetic but symbolic significance. The interior of the Cathedral was considered to be a holy place ripped out of this world, a “heavenly Jerusalem”, which is not illuminated by natural light but by the unearthly and mystical coloured light of God’s glory. According to other explanations the window was regarded as the dividing line between this and God’s world, into which we can glance and thereby uplift ourselves. In the triforium gallery on the first floor stone busts are sited. This represents a unique portrait gallery of Parléř scultures comprising eleven busts of members of the imperial family, three of Prague archbishops, five of master builders and two of the architects, Matyáš of Arras and Peter Parléř. The placing of the portrait busts of the builders among the secular and ecclesiastical dignitaries, testifies to the increasing status of artists, considered in the middle ages more as craftsmen and servants. The sculpture gallery in its way anticipates the Renaissance, displaying genuine respect for the genius of artists. In the modern part of the Cathedral the gallery has busts of artists meriting recognition for their work towards its completion. The Parléř sculpture gallery continues even in the chapels which contain very important stone tombs with reclining figures of the Přemyslide rulers. The stained glass rose window in the western wall, designed by František Kysela, portrays scenes from the different days in the creation of the world. By advancing through the main nave upto the crossing with the transept, we can see in the southern transept the largest of the Cathedral windows, on the theme of The Last Judgement by Max Švabinský. At the same time we can observe on the corner of the St. Wenceslas Chapel the late Gothic Madonna from the beginning of the 16th century. On the pillars of the crossing naves are fixed eight gilded wooden statues of the country’s patron saints: S.S. Wenceslas, Ludmila, Vojtěch, Zykmund, John of Nepomuk, Vitus, Procopius and Norbert. They were created in 1696 by the Castle carver František Preis. 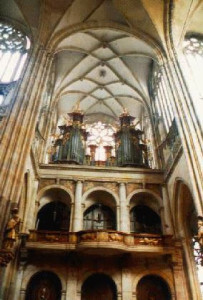 The north transept is dominated by the Renaissance organ loft by Bonifác Wohlmut from between 1559- 1561. 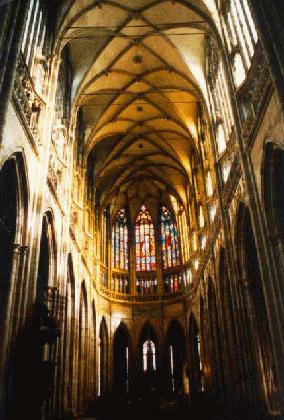 Originally it closed off the main nave of the Parléř Cathedral but during the completion of the Cathedral it was transferred to its present site. In the loft is a Baroque organ built by Antonín Gartner from Tachov in 1757. In the choir in front of the main altar is that part of the tomb of the Bohemian Kings which is above ground – the royal mausoleum, the work of Dutch sculptor Alexander Collin from between 1571-1589. On the sarcophagus of white Austrian marble are carved the figures of the resurrected Christ and the reclining Ferdinand I, his wife Anna Jagellon and son Maximillian II. The tomb is enclosed with a fine Renaissance grill. The main altar, in neo-Gothic style, is from the time of the completion of the Cathedral, the benches along the sides are from the middle of the 17th century and the late Renaissance pulpit which is made of gilded lime wood, originates in the beginning of the 17th century. The stained glass windows in the upper choir are here created according to the designs of Max Švabinský in 1946-1948. The Chapel of St. Ludmila (Christening) is decorated with a stained glass window on the theme of the visitation of the Holy Spirit, by Max Švabinský. By the same artist is the mosaic the Baptism of Christ. In the chapel a Baroque font is placed and a picture “The Entombment of Christ” from the workshop of Michaelangelo Caravaggio. In the Chapel of Christ’s Tomb we can see a stained glass window on the theme of the Acts of Mercy. Our attention is caught by an early Baroque altar from 1674 and a picture of St. Mary Magdalene from 1600. 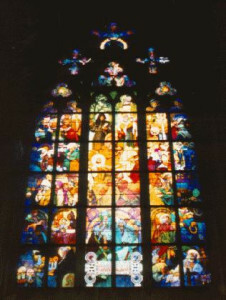 The stained glass window of the Thun Chapel is designed on the theme of the Psalm “Those who Sow in Tears shall Reap in Joy” by František Kysela. The door in the corner of the chapel leads to the capitular library on whose internal wall are installed Renaissance grave stones. The Hasenburg Chapel is situated at the ground level of the tower and is where the entrance to the triforium, to the bells and the clocks, is sited. The chapel belongs to the old part of the Cathedral and was completed in 1396 by Peter Parléř. The chapel is separated from the nave by a partition with a neo- Gothic portal. Off the transept, the St. Wenceslas Chapel protrudes into the conventional layout. It is the most treasured place in the Cathedral, roofed by the Parleéř star-vaulted ceiling. In the chapel the remains of St. Wenceslas, Prince and patron saint of the Czech lands are kept. His stone tomb can be seen directly opposite the north entrance to the shrine. The Prince was originally buried in the rotunda, which he himself built, and his grave remains in the same place to this day even after all the subsequent changes. The decorations of the chapel bear witness to the high level of Czech art in the 14th century. The lower part of the walls is studded with 1345 amethysts, jaspers, chalcedony and agates. It is interesting to note that they are held in place by mortar made with egg whites. Among the semi-precious stones is a series of scenes depicting the suffering of Christ by an unknown painter from the years 1372-1373. This Passion cycle starts and ends above the altar of the chapel created by the original Gothic tomb from the end of the 14th century. At the sides of the Crucified Christ are painted portraits of Charles IV, his fourth wife Eliška of Pomerania, Wenceslas IV and Jane of Bavaria. Next to the altar is the sanctuarium (a cask for the holy sacraments), closed by gilded Gothic grill by master Wenceslas from 1375. On the walls above the Passion cycle runs a second series, illustrating scenes from the life of St. Wenceslas. It is the work of the Master of the Litoměřice altar from 1506-1509, painted over by Daniel Alexei from Květná, in 1612. Above the altar and inserted into this cycle are portraits of four Czech patron saints from 1484-1485 and in the centre an exquisite limestone statue of St. Wenceslas by Parléř’s nephew Heinrich Parléř from 1373. At the sides of the statue, two angels who according to legend accompanied the Prince at his audience with the Emperor Henry I, are painted. Above the statue and in the framework of the St. Wenceslas cycle are painted the figures of King Vladislav Jagellon and his wife Anne de Foi-Candale. In the corner under the window of the chapel stands a tower like reliquary, an exquisite example of metal work by the locksmith Wenceslas, created in 1375 according to the designs of Peter Parléř. In the opposite corner by the entrance to the chapel stands a Renaissance bronze candelabra with the statue of St. Wenceslas made by a Nuremburg sculptor and metal caster Hans Vischer in 1532 and paid for by the guild of Prague maltsters. Next to the candelabra hangs a Renaissance panel painting,“The Murder of St. Wenceslas”, the work of a Master signed with the monogram I.V. in the year 1543. Under the windows we can see a small door leading to the staircase upto the Coronation Chamber, placed above the St. Wenceslas chapel. The doors, just like the armour plated cabinet, have seven locks and their keys are in the keeping of seven distinguished representatives of the city of Prague, the church and the state. The preserved collection of the Crown Jewels comprises the golden St. Wenceslas crown from the time of Charles IV, the sceptre and orb from the time of Rudolf II, and the coronation robe, belt and stole from the first half of the 18th century, the reign of Charles VI. In the middle ages the collection also included a sword, a ring, golen bangles and a crystal annointing vessel. 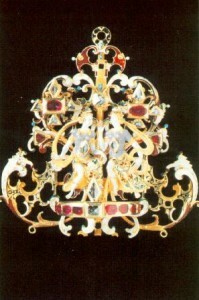 A copy of the St. Wenceslas crown, exquisite goldsmith’s work decorated with precious stones and pearls, is exhibited in the Lobkovic Palace in Jiřská Street. Opposite the doorway a marble monument to the Field Marshall Count Leopold Šlik from 1723 stands. It was designed by Viennese architect Josef Emanuel Fischer from Erlach and executed by František Maximilian Kaňka. The bust of the Count is the work of Matyáš Bernard Braun and the other sculptures come from his workshop. In the Chapel of St. Andrew (the Martinic chapel – originally SS Antony and St. Silvester) the crypt of the Lobkovic and Martinic families is placed. A Renaissance epitaph with a relief by Jan Popel from Lobkovic is set into the west wall. Jaroslav Bořita of Martinice is buried here, thrown out of the window during the second Prague defenestration. Barbora Celská, the wife of Emperor Zykmund also rests in the chapel. In the display case lies a Gothic panel painting called Veraikon (The True Image) – allegedly the likeness of Christ’s face imprinted onto a cloth, which was passed to him by St. Veronica on his way to Golgotha. The right side of the Chapel of the Holy Cross is the work of Peter Parléř, the left side and the following chapels were creations of Matyáš of Arras. On the wall are the remains of Gothic paintings from the end of the 14th century, and above the early 18th century altar hangs a crucifix made of cedar wood, Italian craftmanship from the 15th century. From the chapel it is possible to descend into the underground Royal Crypt. The last time the Royal Crypt was renovated was between 1928-1935. In the centre rests the Emperor Charles IV, in the front on our right rests Ladislav Pohrobek (Ladislav the Posthumous), on our left King George of Poděbrady. In the second row are the tombs of King Wenceslav IV (on the right) and the four wives of Charles IV (on the left). At the back on the right is the neo-Classical coffin of the Duchess of Parma, Marie Amalia, the daughter of Maria Theresa, and next to her are the remains of the Austrian Duke Rudolf II and his son Rudolf Kaše (Rudolf the Weak) [as Bohemian King Rudolf I he reigned between 1306-1307] and Eleanor, the daughter of Emperor Maximilian II. In the centre is placed the artistically most valuable coffin of Emperor Rudolf II, whose copy can be seen in the Castle Tower, Mihulka. Also buried here is Wenceslas, the first born son of Charles IV and on the extreme left Jan Zhořelecký (the brother of Wenceslas IV) and other unknown persons. Below the ground the romains of the Romanesque basilica are preserved. Next to the chapel of the Holy Cross stands the Cathedral vestibule, accessible from the outside via the Gothic south portal from 1350. In the vicinity of the vestibule hangs a fine carved crucifix from around 1410. The Royal Oratory was built into the upper part of the vestibule by Benedikt Ried in 1493 in late Gothic style. It is decorated with naturalistically entwined branches and the monogram of King Vladislav Jagellon on the protruding corbel. On the ballustrade of the Oratory are placed the heraldic shields of lands, over which this sovereign reigned. The Oratory is accessible via a covered bridge directly from the Royal Palace. The statues of miners with their long skirts on which they slid down the mineshafts, were created by the workshop of Matyáš Bernard Braun. From the Oratory the layout of the Cathedral is already visible: the choir with the ring of chapels surrounds the presbytery, in which stands the neo-Gothic altar of St. Vitus. The Chapel of St. Mary Magdalene is called Valdštejn after the burial place of the Valdštejn family. The most significant monuments are the grave stones of the two builders of the Cathedral, Matyáš of Arras and Peter Parléř with their carved portraits. In the ambulatory around the choir screen opposite the chapel, are two reliefs depicting the destruction of the Cathedral by the calvinists in 1619 and the destruction of the sarcophagus of St. John of Nepomuk. These masterpieces of Baroque carving were created after 1631 and are the work of woodcarver Kašpar Bechteler. The Chapel of St. John of Nepomuk, known as Vlašimská, contains the tomb of Archbishop Jan Očko from Vlašim, a work of the Parléř foundry from 1470. The remains of St. Vojtěch are kept in the modern altar. In the ambulatory opposite the chapel stands the Baroque silver sarcophagus of St. John of Nepomuk, the largest work in precious stone in Bohemia. It was designed by Josef Emanuel Fischer from Erlach between 1733-1736. On the marble plinth are placed two angels carrying the coffin, on which reclines the saint’s figure. A baldacchino donated by Maria Theresa, hangs above the sarcophagus. The marble ballustrade is decorated with allegoriacal figures of Silence, Wisdom, Strength and Justice carved in 1746 to a design by Jan Antonín Quittainer. The Chapel of the Holy Relics (Saxon) was founded by the Saxon Duke Rudolf, a son-in-law of Charles IV .Along the sides are the stone tombs of Přemysl Otakar II (on the left) and Přemysl Otakar I (on the right). They are decorated by the reclining figures of the kings, an oustanding sculpture by Peter Parléř. On a pillar hangs one of the cannonballs which fell on the Cathedral during the seige of Prague by the Prussian King Frederick in 1757. The Chapel of the Virgin Mary (Imperial) was founded by Charles IV probably on the site where the building of the Cathedral started. 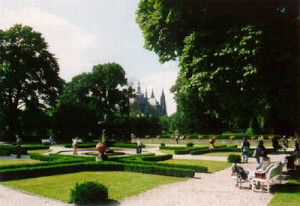 Placed here are the Parléř Gothic tombs of Prince Spytihněv II (left) and Prince Břetislav I (right). Zdeněk Lev from Rožmitál known from the Jirásek novel “From Bohemia to the End of the World” is also buried here. In the Archbishop’s Chapel, Prague archbishops were buried between 1793 and 1899. In here there is also the Pernštejn tomb with a Renaissance sarcophagus of the greatest chancellor of the kingdom, Vratislav from Pernštejn. Opposite the chapel is the large statue of the kneeling Cardinal Bedřich Schwarzenberk, one of the best works of the sculptor Josef Václav Myslbek, from 1895. In the ambulatory between the arcades of the choir, we can see a carved wooden relief “The Flight of Bedřich of Falc (the Winter King) from Prague” after the defeat at the Battle of the White Mountain. The artist Kašpar Bechteler created it before 1625. In the Chapel of St. Anne (Nostická) we find the tombs of the Lords of Žďár and Nostic.In the altar there is a silver Romanesque reliquary, stolen during the French Revolution from the Church of St. Martin at Triers. This important goldsmith’s work decorated with enamelled pictures, filigree work, and precious stones contains 43 holy relics. On the wall of the Chapel hangs a late gothic panel painting “the Madonna in the Rose Bush”. The Stará sakristie (The Old Sacristy) [previously the Chapel of St. Michael] is hidden behind a wall. 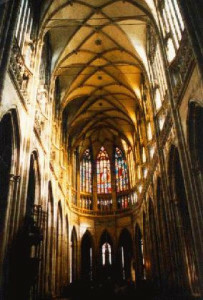 The rectangular space of the Chapel was vaulted over by Peter Parléř in 1362. The ceiling bosses of the vaulting are among the most original contributions of Parléř’s art. On the interior wall of the Chapel above the Renaissance church pew, hangs the picture “The Baptism of Christ” by Petr Brandl from 1722. Above the confessional is hung a copy of the Titian picture “The Entry of Christ into Jerusalem”. 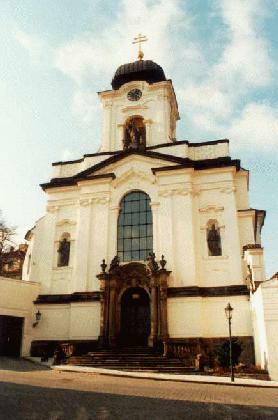 The Chapel of St. Zykmund (Černínská) is the last chapel of the old Cathedral on this side and was built by Peter Parléř. Here were kept the remains of the Burgundian King Zykmund, whose body Charles IV himself had sent to Bohemia. Scenes from the life of the saint are depicted in the Renaissance fresco on the east wall of the Chapel. On the opposite wall we can see a wall painting “The Assumption of the Virgin Mary” by Daniel Alexei from Květná post 1600. The Baroque altar was made according to a design by Josef Emanuel Fischer from Erlach. Also in the Chapel are many Baroque and neo-Classical tombs, of which the most important belongs to Humprecht Černín from Chudenice. In addition the Transylvanian Prince Zikmund Báthory and Sylvia Margravine of Baden are buried here. The Chapel of the Choir is on the ground floor of the Wohlmut organ loft previously mentioned and is enclosed by three carved doors. Inside it, is an early Baroque archbishop’s throne from the second half of the 17th century and a late Renaissance altar from 1579. Next is the Nová sakristie (New Sacristy), where by the inner wall stands a large wooden altar with a relief of the Crucifiction. It was created in 1899 by sculptor František Bílek, and is an important embodiment of the spiritual aims of the Czech Art Nouveau movement. Attached to the New Sacristy is a neo-Gothic spiral staircase leading to the treasure chamber, modified in 1929 as a sacristy. The Archbishops Chapel has been used since 1909 as the burial chapel of the Prague archbishops. The last one buried was on 12 August 1992, the Prague Archbishop and Cardinal František Tomášek an important figure for the Czech nation in the second half of the 20th century. 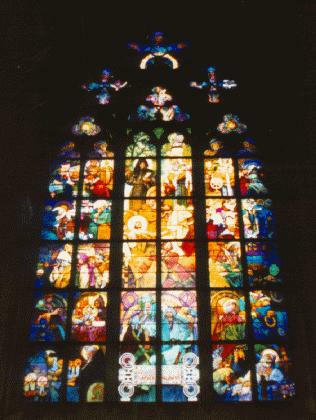 The window was decorated by Alfons Mucha in late Art Nouveau style and illustrates the lives of SS Cyril and Methodius. In the Schwarzenberk Chapel is a captivating window with scenes from the life of Adam František Schwarzenberk and from the history of St. John of Nepomuk. The design was by Karel Svolinský. In the Chapel there is the late Gothic Čimelická ark depicting the Adoration of the Magi, an interesting example of Gothic panel painting. The Chapel of the Bartoň family from Dobenín – well known patrons – is decorated with a mosaic of the Acts of Mercy by František Kysela and by the stained glass window with the theme of the Eight Beatitudes by the same artist. On the altar of St. Agnes is regularly displayed an exquisite “sun” reliquary by Alena Nováková, created in 1989 for the greater glory of this saint and patroness of Bohemia. After visiting this Chapel we leave the Cathedral of St. Vitus.